Sonnenaktivität äußert sich nicht nur in Form von Sonnenflecken. Auch das Magnetfeld der Sonne ändert sich, dass wiederum die kosmische Strahlung beeinflusst. Henrik Svensmark hatte vor etlichen Jahren einen interessanten Zusammenhang der Sonnenaktivität mit den Wolken zeigen können. Bei näherem Hinschauen, musste man jedoch die Interaktion hinsichtlich geographischer Breite, Jahreszeit, Wolkenhöhe und anderen Parametern spezifizieren. Kritiker taten dies nicht und poduzierten mit ihrem zu pauschalen Ansatz jede Menge Fehlkorrelationen, die sie Svensmark hämisch vorwarfen. Mike Jonas gab am 10. Juni 2017 auf WUWT einen Überblick über die Grundlagen der Thematik. Henrik Svensmark selber fasste den Wissensstand im März 2015 in Europhysics News zusammen (pdf hier). A method is developed to rank Forbush decreases (FDs) in the galactic cosmic ray radiation according to their expected impact on the ionization of the lower atmosphere. Then a Monte Carlo bootstrap-based statistical test is formulated to estimate the significance of the apparent response in physical and microphysical cloud parameters to FDs. The test is subsequently applied to one ground-based and three satellite-based data sets. Responses (>95%) to FDs are found in the following parameters of the analyzed data sets. AERONET: Ångström exponent (cloud condensation nuclei changes), SSM/I: liquid water content, International Satellite Cloud Climate Project (ISCCP): total, high, and middle, IR-detected clouds over the oceans, Moderate Resolution Imaging Spectroradiometer (MODIS): cloud effective emissivity, cloud optical thickness, liquid water, cloud fraction, liquid water path, and liquid cloud effective radius. Moreover, the responses in MODIS are found to correlate positively with the strength of the FDs, and the signs and magnitudes of the responses agree with model-based expectations. The effect is mainly seen in liquid clouds. An impact through changes in UV-driven photo chemistry is shown to be negligible and an impact via UV absorption in the stratosphere is found to have no effect on clouds. The total solar irradiance has a relative decrease in connection with FDs of the order of 10−3, which is too small to have a thermodynamic impact on timescales of a few days. The results demonstrate that there is a real influence of FDs on clouds probably through ions. In einer dazugehörigen Pressmitteilung erläuterten die Autoren die Ergebnisse. Eine Übersetzung der Pressemitteilung ins Deutsche gibt es auf EIKE, zusammen mit weiteren Hinweisen von Anthony Watts auf WUWT. Unterm Strich ist es hochinteressant, dass nun der Nachweis gelungen ist, dass sich die kosmische Strahlung in kurzen Maßstäben auf die Wolken auswirkt. Die Anti-Sonnenfraktion fand natürlich wieder ein Haar in der Suppe. Interessierte Leser können sich auf WUWT ein Bild von Willis Eschenbachs Kritik machen.Es wäre toll, wenn Eschenbach seine Kritik einmal in Form einer offiziellen Discussion beim jeweiligen Journal einreichen würde. Tsonis et al. (1) recently used convergent cross mapping (CCM) (2) to identify a causal relationship between cosmic rays (CRs) and interannual variation in global temperature (ΔGT). Subsequently, Luo et al. (3) questioned this finding using the Clark implementation of CCM (version 1.0 of the multispatial CCM package). * This version of the CCM code, which has since been debugged by Clark, unfortunately contains errors that are not in the original rEDM software package that Tsonis et al. used.† Thus, though well-intentioned, the Luo et al. (3) analysis is incorrect. We examined inter-annual variations and long-term trends of cloudless days (CD) and cloudless nights (CN) in 1957–1993 from Abastumani (41.75N, 42.82E), at different geomagnetic conditions and corresponding galactic cosmic rays (GCRs) flux changes. It showed possible influence of cosmic factors on cloud covering processes and, thus, climate change. It was demonstrated that (1) the inter-annual distribution of monthly mean values of planetary geomagnetic index Ap (for low and moderate disturbances) at CDs can be described by harmonic function with semiannual (with sharp maxima in March and September) and annual (with maximum in August) periodicities; (2) the inter-annual distribution of Ap index for CN has an additional maximum in June, where the largest decrease of GCR flux is observed. This phenomenon is expressed even stronger during Sudden Storm Commencement (SSC) events and strong geomagnetic disturbances (Ap≥50), when their relative numbers are the greatest and are accompanied by bigger reduction of GCRs flux; (3) the long-term trends of mean annual and mean seasonal values of Ap index and GCRs flux at CD and CN are estimated. It was detected that, for the latitudes of this region, long-term decreases (negative trends) of seasonal GCR flux are different at CD and CN, which could affect the radiative balance at the Earth’s surface and, as a result, contribute to the climate change. Interannual distribution of geomagnetic Apindex is described by harmonic function. Yearly maximum of Ap index for cloudless nights coincide with minimum of GCR flux. Trends of Ap index and GCRs flux are different for cloudless days and nights. Semiannual variations of lower-upper atmospheric parameters show their coupling. Einen Rückschlag erlitt das Svensmark-Modell im Oktober 2016 als Kancirova et al. sich im Journal of Atmospheric and Solar-Terrestrial Physics schwertaten, einen Zusammenhang zwischen kosmischer Strahlung und Wolken zu finden. In einigen Subkategorien fanden sie schließlich dann aber doch einen Zusammenhang, der es wert ist, weiterverfolgt zu werden. A detailed analysis has been made based on annual meteorological and cosmic ray data from the Lomnicky stit mountain observatory (LS, 2634 masl; 49.40°N, 20.22°E; vertical cut-off rigidity 3.85 GV), from the standpoint of looking for possible solar cycle (including cosmic ray) manifestations. A comparison of the mountain data with the Global average for the cloud cover in general shows no correlation but there is a possible small correlation for low clouds (LCC in the Global satellite data). However, whereas it cannot be claimed that cloud cover observed at Lomnicky stit (LSCC) can be used directly as a proxy for the Global LCC, its examination has value because it is an independent estimate of cloud cover and one that has a different altitude weighting to that adopted in the satellite-derived LCC. This statement is derived from satellite data (http://isccp.giss.nasa.gov/climanal7.html) which shows the time series for the period 1983–2010 for 9 cloud regimes. There is a significant correlation only between cosmic ray (CR) intensity (and sunspot number (SSN)) and the cloud cover of the types cirrus and stratus. This effect is mainly confined to the CR intensity minimum during the epoch around 1990, when the SSN was at its maximum.This fact, together with the present study of the correlation of LSCC with our measured CR intensity, shows that there is no firm evidence for a significant contribution of CR induced ionization to the local (or, indeed, Global) cloud cover. Pressure effects are the preferred cause of the cloud cover changes. A consequence is that there is no evidence favouring a contribution of CR to the Global Warming problem. Our analysis shows that the LS data are consistent with the Gas Laws for a stable mass of atmosphere. CLOUD data are fed into a global aerosol model to calculate climate effects. When new particles develop in the atmosphere, this influences cloud formation and with that the climate too. Since a few years, these complex processes have been reproduced in a large air chamber within the CLOUD experiment at CERN. Researchers have now used the results for the first time to calculate the production of aerosol particles in all the Earth’s regions and at different heights. The study published in the journal “Science,” in which researchers from Goethe University Frankfurt were involved, deciphers the role of the various chemical systems which are responsible for particle formation. They also determined the influence of ions which develop through cosmic radiation. Soot particles, dust lifted up by the wind or sea spray account for only some of the particles in the atmosphere. Others develop from certain trace vapours, for example when individual sulphuric acid and water molecules cluster as tiny droplets. This formation of new particles is known as nucleation. Clouds are formed by water condensing on the larger aerosol particles or what are known as cloud condensation nuclei. The more cloud droplets develop, the more sunlight is reflected back into space. Climate models show that the additional particles caused by human activity produce a cooling effect which partially offsets the greenhouse effect. It is, however, less than previously assumed. The model calculations presented in “Science” prove that about half the cloud condensation nuclei in the atmosphere originate from nucleation. In the atmosphere today, particle formation is dominated almost everywhere by mechanisms where at least three chemical components must come together: apart from the two basic substances, i.e. sulphuric acid and water, these are either ammonia or specific organic compounds such as oxidation products from terpenes. Close to ground level, organic substances from natural sources are important, whilst ammonia plays a key role higher up in the troposphere. Ammonia and sulphur emissions have increased considerably over the past decades as a result of human activities. CLOUD has also investigated how the 11-year solar cycle influences the formation of aerosol particles in our present-day atmosphere. The model calculations show that the effects as a result of changes in ionisation through the sun are too small to make a significant contribution to cloud formation. Although the ions are originally involved in the development of almost one third of all newly formed particles, the concentration of the large cloud condensation nuclei in the course of the 11-year cycle changes by only 0.1 percent — not enough to have any sizeable influence on the climate. The CLOUD team has also presented first global model calculations for aerosol formation caused without the involvement of sulphuric acid and solely through extremely low volatile substances of biological origin (Gordon et al., PNAS). According to the findings, this process contributed significantly to particle formation above all in the pre-industrial atmosphere, since at that time far less sulphur components were released into the atmosphere. The number of particles in the pre-industrial atmosphere is now estimated to be far greater through the additional process than was shown in earlier calculations. The model calculations, which are based on data from the CLOUD experiment, reveal that the cooling effects of clouds are 27 percent less than in climate simulations without this effect as a result of additional particles caused by human activity: Instead of a radiative effect of -0.82 W/m2 the outcome is only -0.60 W/m2. Das CERN konnte angeblich keinen spürbaren Effekt der kosmischen Strahlung auf die Wolken in ihrer Experimentierkammer finden. Eine große Enttäuschung für alle Svensmark-Fans. Aber wie vertrauenswürdig sind die Resultate? Schon früh trennte sich das CLOUD-Konsortium von Svensmark, so dass er keinen Einfluss mehr auf die Experimente nehmen konnte. Wollte das CERN vielleicht gar nichts finden, da man anonsten viele Milliarden Euro Förderung für das Brot-und-Butter-Geschäft riskieren würde, wenn man unbequeme Zusammenhänge aufdecken würde? Now and then new results appear that suggest that the idea of cosmic ray influence on clouds and terrestrial climate does not work. “Sun-clouds-climate connection takes a beating from CERN” is the latest news story which is based on a new paper from the CLOUD collaboration at CERN . It is important to note that the new CLOUD paper is not presenting an experimental result, with respect to the effect of cosmic ray generated ions on clouds, but a result of numerical modeling. CLOUD is using their experimental measurements to estimate the typical nucleation of various aerosols of small size (1-3 nm). However, for an aerosol to affect clouds (and climate) it must first grow to 50-100 nm, to become cloud condensation nuclei (CCN). CLOUD then uses a numerical model to estimate the effect of cosmic rays on the growth process, and finds that the response of cosmic rays on the number of CCN over a solar cycle is insignificant. This type of numerical modeling is by no means new, and neither is the result that ions in these models apparently do not affect cloud formation. We have known this for about 7 years. For example the CLOUD results, with respect to cosmic rays and clouds, are very similar to the conclusions of Pierce and Adams from 2009  where they also use a numerical model to grow small nucleated aerosols to CCN, and also find only a small change in CCN as a function of ion changes. In fact this result has been found a number of times in similar models. The argument for the lack of response to ions is the following: In the presence of ions additional small aerosols are formed, but with an increase in the number of aerosols, there is less gas to each particle, and they therefore grow slower. This means that the probability of being lost to larger particles increases, and fewer survive. So why, in contrast to the above, do I think that the cosmic rays cloud idea is still viable? The reason is that we have tried to answer the same question (do ion-nucleated aerosols grow to CCN) without using models — and get very different results. In 2012 we tested the growth of nucleated aerosols to CCN in our laboratory and found that when no ions were present the response to increased nucleation was severely damped, in accordance with the above mentioned models; but with ions present, all the extra nucleated particles grew to CCN sizes, in contrast to the numerical model results . Now it may be that the conditions we have in the experiment are not as in the real atmosphere. There are complex processes in the real atmosphere that that we cannot include, whose effect may change the experimental result, as we have been told many times. It is therefore fortunate that our Sun makes natural experiments with the whole Earth. On rare occasions “explosions” on the Sun called coronal mass ejections, results in a plasma cloud passing the Earth, with the effect that cosmic rays flux decreases suddenly and stays low for a week or two. Such events, with a significant reduction in the cosmic rays flux, are called Forbush decreases, and are ideal to test the link between cosmic rays and clouds. Finding the strongest Forbush decreases and using 3 independent cloud satellite data sets (ISCCP, MODIS, and SSM/I) and one dataset for aerosols (AERONET), we clearly see a response to Forbush decreases. These results suggest that the whole chain from solar activity, to cosmic rays, to aerosols (CCN), to clouds, is active in the Earths atmosphere. From the MODIS data we even see that the cloud microphysics is changing according to expectations. 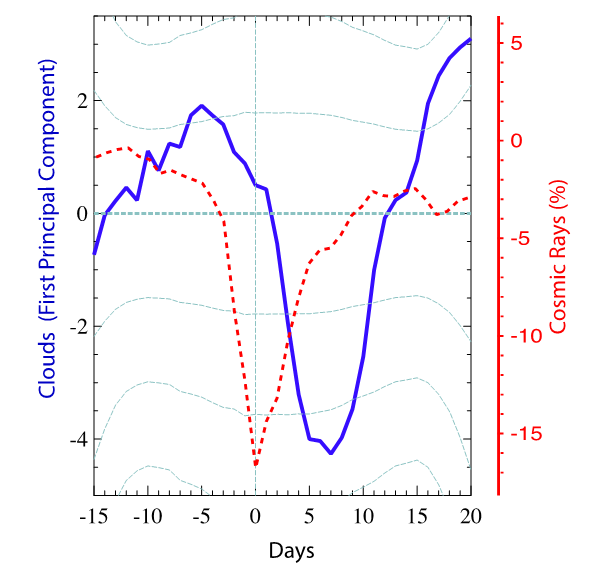 Figure 1 display the superposed signal in clouds (blue curve), based on the above three satellite datasets, in the days following the minimum in cosmic rays of the 5 strongest Forbush decreases (red curve). The delay in the minimum of the two curves is due to the time it takes aerosols to grow into CCN. A Monte Carlo simulation was used to estimate the significance of the signal, and none of 104 random realizations gave a signal of similar size. Please see our latest paper from 2016 for further evidence . Figure 1: Statistical common disturbance in clouds (1 Principal component) based on three cloud satellite data sets (ISCCP, MODIS and SSM/I) superposed for the five strongest Forbush decreases (blue) curve. Red curve is the change in (%) of cosmic rays superposed for the same five events. The thin lines are 1-3 standard deviations. Adapted from . Finally, there are a large number of studies showing that past climate changes are closely correlated to variations in cosmic rays. For example, the energy that goes into the oceans over 11 years solar cycle is of the order 1-1.5 W/m2, which is 5-7 times too large to be explained by solar irradiance variations . Therefore something is amplifying the solar cycle, and “cosmic rays and clouds” is a good candidate to explain the observed forcing. In conclusion, observations and experiments go against the above mentioned numerical model result. As I see it, something is missing in the prevailing theory. A solution to this problem is still worth pursuing. J. R. Pierce, P. J. Adams, Can cosmic rays affect cloud condensation nuclei by altering new particle formation rates? Geophys. Res. Lett. 36, L09820 (2009).